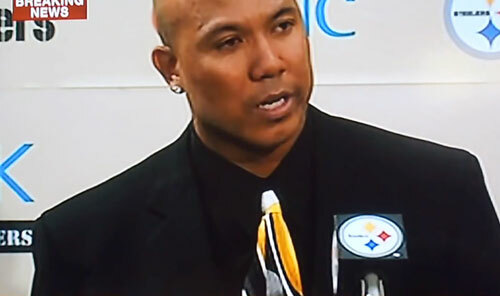 YORK, PA. — Steelers great, Hines Ward, has been named the featured speaker at a major upcoming fundraising dinner organized by the York County Youth Development Center. The event takes place Tuesday evening, Sept. 23, 2014 at 6:00 p.m. in the Valencia Ballroom located at 142 N George St. in York, PA. The event is geared for adults and is supported entirely by sponsorships and through ticket sales. A limited number of corporate sponsorships are still available. All proceeds benefit the Center’s programs for at-risk youth. For ticket information, click here. Photo shows former Pittsburgh Steeler, Hines Ward, delivering his emotional retirement speech. Besides Ward, attendees will also hear from local artist Ophelia Chambliss, Department of Public Welfare Secretary Bev Mackereth and enjoy a performance by the famous YDC Street Beats! The team uses recycled materials and buckets to create rhythms and music. Source: Fox43 Central Pennsylvania. Watch Hines Ward’s emotional speech as he announces his retirement as a Steeler. Hines Ward is a retired wide receiver who played fourteen seasons for the Pittsburgh Steelers. Ward was voted MVP of Super Bowl XL, and upon retirement was one of only eight NFL players to have 1,000 or more career receptions. Besides his career in the NFL, Ward also appeared on the reality TV series Dancing With The Stars where he won the Mirror Ball Trophy. He is currently a studio analyst for NBC’s Football Night in America.